H. L. Burke is the author of over 15 books of whimsical fantasy set in magical worlds. 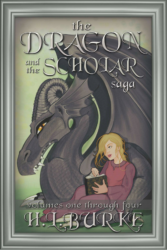 Her stories range from MG to upper YA and feature dragons, heroes, and lots of snarky wit. She lives wherever the military finds it convenient to send her husband with her two super-hero-princess daughters, a truly excellent cat, and a sneaky German Shepherd. I really started writing very young, so it is hard for me to put my finger on what exactly was my first novel. Considering that I published a book, then took it down for edits after my self-publishing platform took off, then republished it a few years later, it’s even hard for me to answer which is my first published novel. Because of that, for me, there really isn’t an experience that encapsulates becoming a writer for me. The easiest thing to compare it to is falling in love with my husband … which I also got a very early jump on because he was my grade school crush. Similarly to writing, I was always intrigued by Matt. I thought about Matt a lot. I chased Matt, found excuses to hang out with Matt, I flirted with Matt, I practiced signing my name with his last name for years (surrounded by the prerequisite hearts, of course) … at the same time I was flirting with writing, practicing my writing, focusing on my writing. Somewhere in high school it went from a silly crush/something I did in my spare time to keep myself busy to something I felt I’d be lost without. I’m not sure how it got to the point where I went from basically giving up on both (because after high school the “you can’t make money off writing” and the “Matt never came around to liking you back and joined the Marine Corp and moved away” thing hit nearly simultaneously) but in spite of me telling myself with both that they weren’t things I could rely on (Matt wasn’t coming back. I needed to concentrate on something as a career that could actually pay bills), whenever I thought about being happy … I still thought about writing and Matt. I actually got Matt first. He came back in town on leave, and in spite of the fact that we’d only exchanged a handful of emails off and on during the previous few years, we went from zero to married in a little under a year. And similarly while I had early drafts of things that were novel length, and kind of similar in plot/theme to my first few novels (I came up with the idea that eventually became Dragon’s Curse in high school and had a first draft that involved the same character names and several scenes which did eventually make it into the book in some form. Also, An Ordinary Knight was first written when I was 18), they weren’t ready … just like my crush on Matt probably wouldn’t have survived the trials of a real marriage, multiple cross country moves, and other tumults. As mentioned in the last answer, I have been writing off and on since I was very young. I completed novel-length works several times during high school (yes, I still have them in folders somewhere. No, you can’t read them). 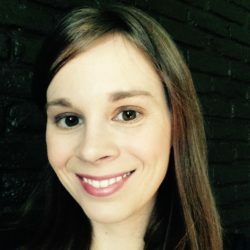 After getting married (and having a baby, and moving from Oregon to California to Japan to Florida in the span of five years), I had kind of slipped to “never finishing anything longer than a short story/blog post.” Then having just arrived in Florida with a four-year-old and a 9-month-old and a new puppy, I thought, hey, this is the perfect time to try NaNoWriMo (National Novel Writing Month, 30 days, 50k words)… so I did. Breaking through the “I’m too busy with my kids to write” excuse (and developing chronic heartburn, possibly due to the extreme caffeine consumption that started simultaneously) was a lot like setting free a wind-up toy. All that “potential” energy became “kinetic” energy (sorry, my now 9-year-old was learning about energy/motion/simple machines in science this week) except I think I may have cracked perpetual motion (take that, physics!) because I’m not stopping. Coffee is a tool, right? Oooh, I want more coffee. I like to stay very flexible. I’ve started to skew more towards plotter as I progress … I used to just think about my books a lot and then write out a quick “to do list” for my characters that would go something like, “Boyfriend disappears, get betrothed to prince, get kidnapped, escape, get captured again, OMGOSH BOYFRIEND BACK, fire swamp, captured, storm the castle, happily ever after…” and work off that. Then a lot of times I’d get to a turning point and realize something didn’t make sense so I’d sit down and write out scenarios until I figured out what was wrong and what didn’t make sense. Beggar Magic was the first book I really did this with because I got to the middle before I realized the bad guy wasn’t working alone (spoilers) and I had to go back and figure out who was helping him and why … and that changed the ending a lot. Then I wrote Cora and the Nurse Dragon and changed up my methods. I was not planning to do NaNoWriMo (National Novel Writing Month) that year, but two days before it was to begin, I had this idea for a Middle Grade novel spring into my head fully formed. Rather than cheat and start writing in October, I wrote out a chapter by chapter synopsis of the story … and then stuck to that synopsis very closely. I wrote that book in 14 days. Fastest write up ever. 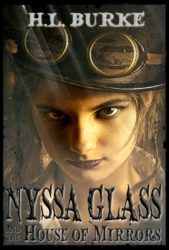 My next book was Nyssa Glass and the House of Mirrors, so I thought, well, it worked well, let’s try it again. Thought about what I wanted to do for a few days, then when I had most of the ideas, sat down, wrote out a chapter by chapter synopsis, mostly stuck to it, BAM … Book practically wrote itself. I do allow myself to deviate in large or small ways if I “discover” something along the way, but this hybrid method seems the best mix of flexibility and keeping things moving at a good clip. My own or someone else’s? Honestly, if we’re talking a book by another author, I don’t want them to make any more because I am way behind in my TV/movie watching and adding one more thing I feel socially obligated to watch would just make me anxious at this point. I still haven’t seen Rogue One for gosh sakes, and Wonder Woman is coming out, and I have to see that, and a friend told me Arrival is a must see. Just way too much watching to catch up on already. As for my own work, either the Nyssa Glass series (because they are quick paced and could be a lot of fun with a visual medium, because Steampunk) or Cora and the Nurse Dragon as an animated series. With Nyssa Glass the relationship between her and Ellis is kind of the most precious aspect. They have a great dynamic, and I’d hate to see that turn into something less loving for the sake of tension. With Cora, I’d worry the subtly of the messages would be thrown out in favor of a big, flashy villain. I don’t think I have hopes as an author. I kind of just do this because I can’t stop. Maybe something on that theme? if I didn’t bring them to light. Hey, I have dragons. They’re friendly. A little sarcastic, but friendly … also magic, lots of magic and snark, so much bantery snark. I love this on so many levels!! And … good to know that Buddy the Elf is NOT on the elevator pressing all the buttons! I totally agree that Nyssa Glass would make a great TV series! !